Remember last week, when we wrote about a newly discovered bird from Africa, and it was already threatened by extinction? Well guess what — it’s happened again. 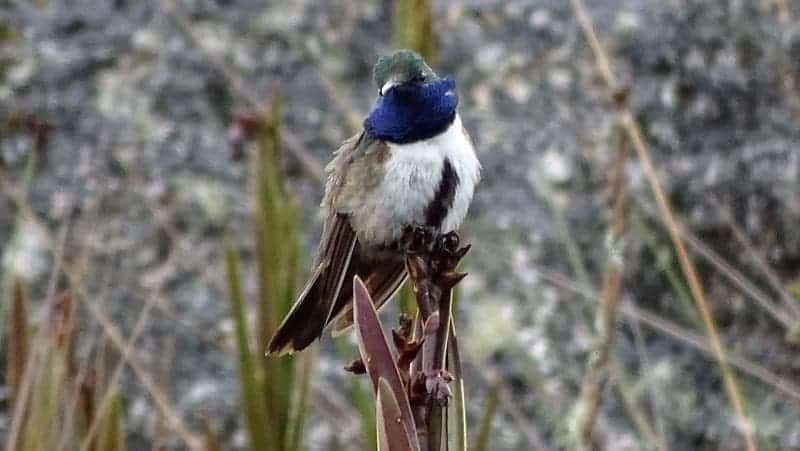 This time researchers working in the Andes describe a previously-unknown hummingbird species which is already under threat, largely due to human activity. This photo of a previously unknown species of hummingbird led to the discovery of the critically endangered Blue-throated Hillstar. Credit: F. Sornoza. Hummingbirds are unusual enough, but even among them, hillstars stand out: they live in high-elevation habitats in the Andes mountain range, and as a result, have developed special adaptations to colder climates. Francisco Sornoza of Ecuador’s Instituto Nacional de Biodiversida first observed and photographed this particular hillstar during fieldwork in southwest Ecuador in April 2017. Francisco had a feeling he’d come across a new species, and he convinced fellow researchers Juan Freile, Elisa Bonaccorso, Jonas Nilsson, and Niels Krabbe, to help. Together, they returned in May to capture specimens and confirm the finding. They dubbed the new species Oreotrochilus cyanolaemus, or the Blue-throated Hillstar, for its iridescent blue throat. So far, so good — but this is where things start to get nasty. The Blue-throated hillstar is found in a very limited range, only along the bush-lined creeks in an area of about 100 square kilometers (160 square miles). Researchers estimate that at best, there are about 750 individuals, but the real number is likely below 500. Not only is the species threatened by wildfires and grazing, but gold mining also started to chew away at its habitat. Considering all of this, researchers say that bird meets all the criteria to be considered critically endangered. This hillstar is also difficult to study because its habitat is very inaccessible. This makes the finding even more exciting — and the conservation even more difficult. “The hillstar hummingbirds occur in the most rugged, isolated, and inaccessible parts of the Andes, where they roost in caves, forage on the ground, and spend half their lives in hypothermic torpor, so the discovery of a new species in this group is incredibly exciting. This striking discovery confirms that life in the high Andes still holds many secrets to be revealed,” according to the University of New Mexico’s Christopher Witt, a hummingbird expert who wasn’t involved in the study.